Photo is from an updated version of our Tuscan Arugula Salad recipe. The newer version includes the Recipe Card format for easy printing. As we tussled over the last bits of this arugula salad, I figured it was definitely blog worthy! I’ve been focused on things Tuscan in the kitchen lately, as I’m getting to cook the main course for a wine club gathering next week focused on the region. So I picked up some radicchio to toss in along with some of the usual suspects in this salad. I call it “Tuscan inspired arugula salad” because my understanding is that Tuscans would typically add some arugula to flavor other salad greens, as opposed to featuring it on a stand-alone basis. But we love the flavor of this peppery green, so I like to let is shine on its own. And much to the pleasure of my frugal foodie self, I find I can get at least 2 nights of big salads out of 1 densely packed 5 oz container of baby arugula. So this salad gets its inspiration from the Tuscan countryside, but I’ve added my own twists. 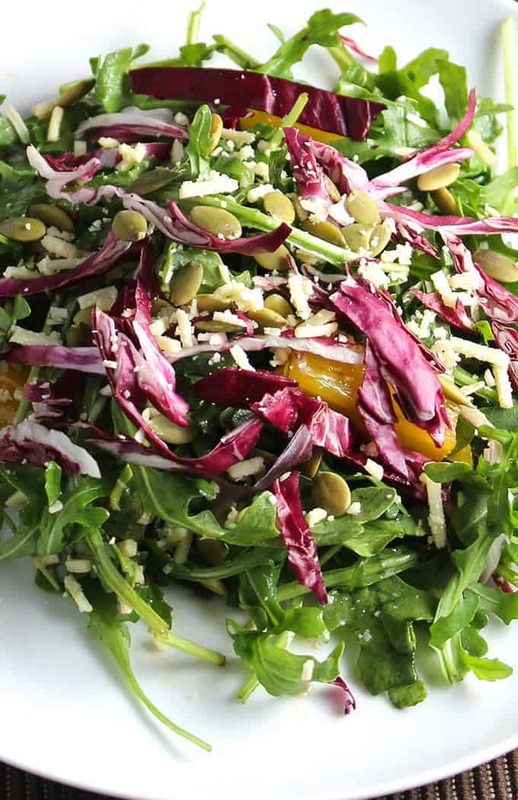 I made this Tuscan Inspired Arugula Salad recipe two ways this week. The first night I was focused on making a batch of Super-Tasty Meat Sauce (stay tuned, will be posting that for Wednesday’s #WeekdaySupper! ), so I made the simplest of vinaigrettes to use for the salad. Last night, we had leftover pasta, so I wanted to spruce up the meal with a dressing that had more going on. Both ways, it’s very tasty. Why not try it both ways, and tell me which you like better? *I’d suggest substituting other fresh herbs if you don’t have sage or rosemary, as opposed to dried. But if you just have dried on hand, use just a pinch of each. Make the dressing: I like to get the dressing ready first, especially for the Feeling Fancy version, as it gives time for the flavors to meld and cranberries to soften. For the simple version, simply whisk the oil and vinegar together. If you’d like, add a bit of mustard to enhance the consistency. 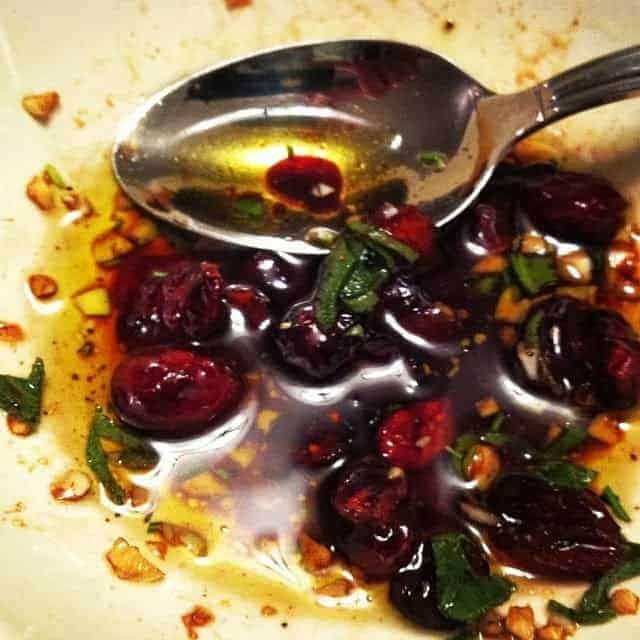 Start the Feeling Fancy version by putting the minced garlic in a bowl, then whisk in the olive and balsamic vinegar. Continue stirring in the remaining ingredients, one at a time. The honey and the cranberries give a bit of sweetness that contrasts well with the peppery arugula and slightly bitter radicchio. 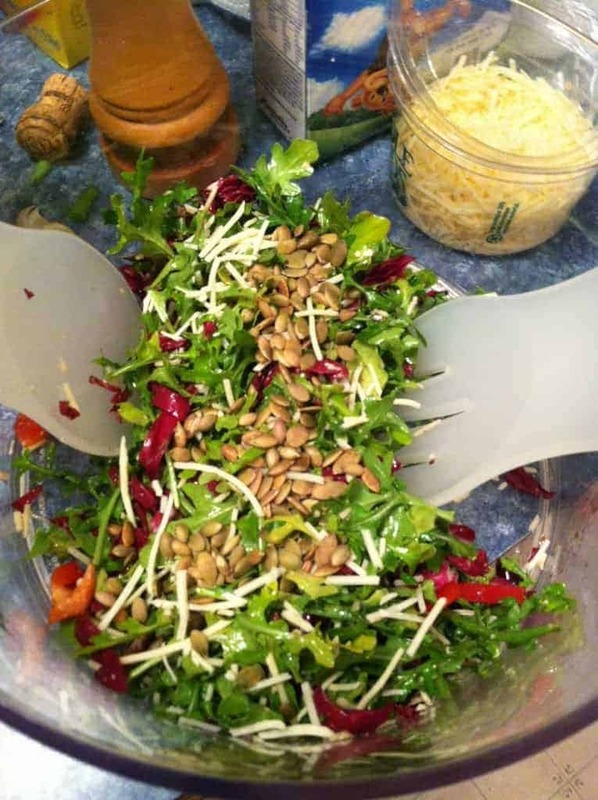 Make the salad: Rinse the arugula and dry well, using a salad spinner if you have one. Place the greens in a large salad bowl. Top the arugula with the chopped peppers and radicchio, and sprinkle a bit of cheese on top. Add your salad dressing to the salad, toss well to get the salad well coated. This proportion is enough to cover the leaves and add good flavor without making it overly saturated. After tossing with the dressing, sprinkle the pumpkin seeds and a bit more cheese on top of the salad. You are ready to serve and enjoy! This works particularly well alongside a pasta dish.